Meticulously cared for Executive HOME on an over sized corner lot overlooking the pond in the STOREY GROVE Community. This is the newest area of Winter Garden, just off SR 429 and convenient to almost anywhere. 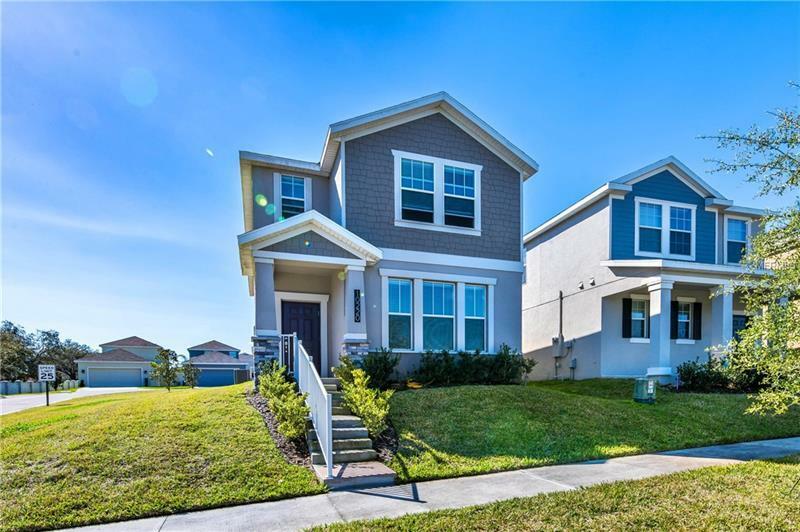 Easy access to all the major highways, close to Disney, Orange County National Golf, Horizons West/Hamlin new retail area and of course Winter Garden Village, the Florida Hospital Annex, top rated schools, great shopping, restaurants, golfing, recreation and resort. The home is appointed with all the best features. Hardly an option was missed, from the best in decor to the highest technology and energy efficiency. Beautiful tile floors on the first level and the kitchen shows off dark wood cabinetry with satin knobs and fixtures and quartz countertops and stainless appliances. ***TWO MASTER SUITES***One is on the FIRST Floor and can also be a guest suite or an office. Ground floor also boasts a laundry room with washer and dryer included and powder room. The stairs leads to the generous LOFT area! Perfect for that playroom for the kiddies (whether big or small)! Den, computer, game or media room. The LARGER MASTER SUITE is separated from the others by the loft, and two other good size bedrooms and the 3rd bathroom are on the other side. Large closets offer plenty of storage. This home promises not to disappoint!